Condition is Used/Like New. See pictures for condition. Canon MT-24EX Macro Twin Lite Flash. This flash was rarely ever used, all together probably for around 200 photos only. It's clean, in excellent condition. Housing has only light scuffs from storage. (It's the Yongnuo first Macro TTL Flash Speedlite, it has two flash head, 4pcs Adapter rings （52mm, 58mm, 67mm, 72mm ), and mounting ring. Sound prompt system When the sound prompt system is enabled, different sound modes will prompt different working conditions of the speedlite so as to allow you to focus on shooting process (Note: the sound can be turned off). Flash is in good working condition. The Macro Twin Lite MT-26EX-RT is a portable, indispensable lighting tool for anyone serious about enhancing their close-up photography. Versatile and ready to be adjusted for a variety of applications, each of the Macro Twin Lite MT-26EX-RT's flash heads can rotate up to 60° horizontally and 45° vertically. Canon MT-24EX Macro Twin Lite Flash with Soft Case. Condition is Used. Shipped with USPS Priority Mail. ThisCanon MT-24EX Macro Twin Lite is in very good condition. It includes the original box, case and manual. The flash stand shown is not included and is for imaging purposes only. EF 50mm f/2.5 Compact Macro. You're purchasing a Canon MT-24EX macro twin lite flash. The unit is in great shape, very clean with only light wear from usage. The flash is fully working. Includes 67mm adapter, case, manual, and box. The new Macro Twin Lite gives serious close-up, nature, and macro enthusiasts a different option in macro lighting - a directional quality of light, as opposed to the rather "Flat" character of the traditional ring lite. For sale is a used Canon MT-24EX TTL Macro Twin Lite macro flash with the manual in the original box. This flash was rarely used, still inEXCELLENT condition. The flash body is clean and everything works perfectly as it should. THE RING PART OF FLASH, WHICH FITS ON FILTER THREADS, WHERE THE "A" AND "B" LIGHTS ARE ATTACHED IS NOT AVAILABLE. Two flexible tubes allow no more rigid angles in macro lighting. 1 ML-2D Twin Macro ring flash. High brightness LED lamp,supporting with flash and lighting. Two lighting mode to choose from "Light" and "Flash" mode. EF 50 mm F 2.5 compact macro. EF 100 mm F 2.8 macro. EF 100 mm F 2.8 macro USM. EF - S 35 mm F 2.8 macro IS STM. EF - S 60 mm F 2.8 macro USM. MP-E 65 mm F 2.8 1 - 5 x macro photo. ※ EF-M 28mm F3.5 macro IS IS can not be installed. The Flash head can be /-45° up / down, 30 °, swung to the inner, outer 60 ° the holder may 30 ° upwards, 50° be positioned downwards. For balanced exposure even in difficult situations, the MT-24EX macro Flash designed for E-TTL auto Flash. Each R200 can rotate up to 60°horizontally and 45° vertically. 122g Each flash including 2xAAA. 2 x MK-R200 Wireless Remote Flash. LED light: 0.5W, 5500K±200, Ra 90. We will solve the problem until you are satisfied. 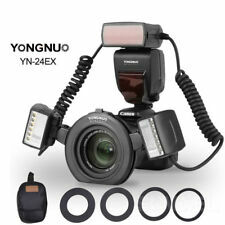 (It's the Yongnuo first Macro TTL Flash Speedlite, it has two flash head, 4pcs Adapter rings （52mm, 58mm, 67mm, 72mm ), and mounting ring. When the sound prompt system is enabled, different sound modes will prompt different working conditions of the speedlite so as to allow you to focus on shooting process (Note: the sound can be turned off). Each R200 can rotate up to 60°horizontally and 45° vertically. 1 x MK-GT620 TTL Transceiver. 2 x MK-R200 Wireless Remote Flash. 6 x Adapter Rings ( 52mm,55mm, 62mm, 67mm, 72mm, 77mm ). LED light: 0.5W, 5500K±200, Ra 90. The YN24EX is equipped with standard PC synchronous interface which allows you convenient to use synchronous flash by using PC synchronous line. 1 x Yongnuo YN24EX Macro Ring Flash. When the sound prompt system is enabled, different sound modes will prompt different working conditions of the speedlite so as to allow you to focus on shooting process (Note: the sound can be turned off). The Albinar T720VL Professional Dedicated Digital TTL Flash with LED Video Light is an essential multitool for Photographers and Videographers to have in their gear bag. The T720VL features an LED light on the front of the flash body that can be used to illuminate nearby subjects in dim light. Albinar 100MDT - Twin, Universal Flash unit. for Canon,Nikon,Pentax, etc. VG used condition. Battery tested & working. Requires 4 AA batteries (not included). Head rotates between 90° & 180°. Diffuser is included (unsure if it originally came with this unit). Actual photos. All content © Bernies Photo Center 1958-2012. Compatible with all Canon EOS models including: 1D/1Ds, 5D, 7D, 50D, 60D, T1i, T2i, T3/3i, XSi, XS, XT/Ti, 300D, 400D, 450D, 1000D. Creates natural background lighting with twin flash firing. Find a lower price?. 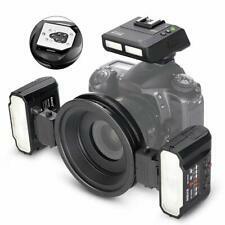 New designed ML-2D LED macro flash for Canon. ML-2D Twin Macro ring flash x1. Any model of NIKON or Canon or. 3,High brightness LED lamp,supporting with flash and lighting. (not suit for old interface). 1 Piece ML-2D Twin Macro Ring Flash. - Flash GN :21. - LED Quantity : 24 (Left is 12pcs and Right is 12pcs). - Color Temperature: 5500k. - Model: ML-2D. - Item Weight: 184g / 6.5oz.